The ultimate goal in designing and publishing a webpage is to share information. However, the high number of webpages added to the Web daily has made the Web a sea of all kinds of data and information, which provides a challenge for information retrieval. The amount of information on the Web, as well as the number of hosts and domain names registered worldwide, are growing rapidly.4 There are currently more than 1 trillion webpages and it is estimated that the number of webpages will continue to grow to infinity. Several billion webpages are added to the Web daily.4 This new information must be made accessible to everybody for a webpage to achieve its intended goal. To overcome these retrieval problems, more than 20 companies and institutions have developed search tools, such as Yahoo, AltaVista, Google and Lycos. Search tools can be classified into two basic types: directories and search engines.5 The main difference between directories and search engines is that a directory is built by people, whereas the search engines database is created by software known as spiders or robots. Searching, instead of browsing, is the main feature of search engines. The advantage of search engines over directories is that they are very comprehensive, often including thousands of sites in the results listed. The disadvantage therefore is having to weed through thousands of irrelevant sites to find what you are looking for, because, although search engines attempt to list sites in order of relevance, this relevance is determined by a mathematical formula that is far from perfect. Search engines are particularly useful when searching for a specific topic that may not be found in a directory.6 Search engines are tools for searching for information and directories are collections of human-reviewed Web sites that have been arranged into topical categories. Therefore directories impact search engines, hence the interchangeable use. Although they have different search strategies, both search engines and directories have similar interfaces and are commonly known as search engines; we therefore refer to both types as search engines in this paper. Considering the challenges faced by most search engines, the need for better search engines to more easily Users tend to always return to one or two search engines with which they are comfortable. However, which search engine actually satisfies a user's need and which is the best? To answer these questions, a user must clarify their needs and which features they prefer, for example the amount of information retrieved, the speed at which search results are retrieved or the relevance of the search results. 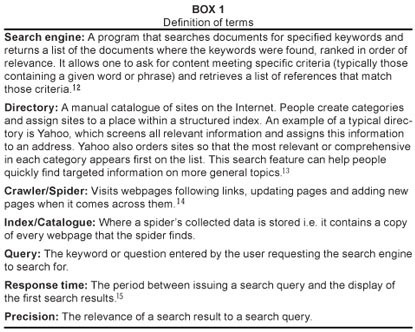 There are different ways to organise Web content but every search engine has the same basic parts which include a crawler or spider, an index or catalogue, and an interface or query module (Box 1). Users enter a search term through a predefined query module, specific to each search engine. Typically, the search engine works by sending out a spider to fetch as many documents as possible. Then another program called an indexer reads these documents and creates an index based on the words contained in each document. Each search engine also uses a proprietary algorithm to create indices which ideally enable only meaningful results to be returned for each query. In general, a search engine starts with a set of predefined Web addresses and downloads them. For each page, it extracts the uniform resource locator or URL in order to follow them later in a specified manner. It then indexes all of the words and phrases as well as the relative position of the words to each other. The user can then search this index through the results retrieved for the presence of a particular word, phrase or combination of words in a Web document. Ten search queries were used to test seven different search engines; both the precision and response time of the search results retrieved were then compared amongst the search engines. The search engines selected for comparison in this study were Yahoo, Google, Gigablast, AlltheWeb, Zworks, AltaVista and Bing/MSN. During the process of selecting Web search engines to be evaluated, attention was paid to including a diverse range of search engines so that the results obtained could serve as a basis for evaluating the search algorithm used by the various search engines. Some of the selected search engines are not the most popular or most familiar. The results of the study will therefore enlighten users about their different capabilities and thereby potentially increase the usage of the better performing search engines. For each query, only the first ten search results were evaluated. For most users, the first ten retrieved results are the most important, i.e. almost all users hope that the first ten search results will provide what they are looking for and if this is not the case, they become frustrated and usually try another search engine.17 Considering that all selected search engines display results in descending order of relevance, it is believed that this methodology did not critically affect the validity of the results. Microsoft Internet Explorer was chosen as the Web browser for the study because it is compatible with all the search engines selected and is the most widely used browser locally. Two computers with different configurations but with the same parameters were used: an Acer computer with an Intel Celeron M Processor 440, 80 GB hard disk (1.86 GHz speed) and 52 MB DDR2 memory and a Hewlett Packard computer (2.10 MHz speed) with an AMD Semipro SI-42 processor, 140 GB hard disk and 1 GB RAM. One computer was used for the entire experiment, which was repeated for validity on the second computer, i.e. each query was run twice. The results shown are those obtained from the Hewlett Packard computer. Results from the repeated exercise are not presented because they were comparable and do not alter the outcomes of the study. Ideally, each query should be executed on all search engines at the same time, so that if a relevant page is added, none should have an advantage of being able to index the new page over the other. For this study, that was not practically possible and so each query was searched on all the search engines within thirty minutes of each other on the same day. Those search engines returning an error of '404' (i.e. path not found) or '603' (i.e. server not responding) were noted in order to be returned to. Return visits were made at different times of the day to allow for the possibility that the site might have a regular down time for maintenance. Response time was calculated as the period between entering a search query and retrieval of the first search results and was measured by a stopwatch. We selected one query from each group to assess response time. The queries selected were: Query 1 (Group A), Query 6 (Group B), Query 8 (Group C) and Query 10 (Group D). The average response times for each search engine and for each selected query were then calculated. For this study, precision was defined as the relevance of a search result to a search query and was determined separately by both investigators for the first ten search results. We checked the content of each retrieved result to determine whether it satisfied the expected result, but did not attempt to read the full-text Web document by following the links provided because of time considerations and variable reliability of the links. A precision score was calculated based on the number of results within the first ten retrieved deemed to be relevant (i.e. a score of 1 indicates that all ten search results were relevant and a score of 0.5 indicates that only five of the first ten results were relevant). In order to assess the overall performance of each search engine we evaluated, we not only computed the average precision score for each query, but also calculated the average precision score, based on all ten queries, for each search engine. The mean response times for all the search engines were within the range of 2 s  9 s during off-peak hours. During peak hours, mean response time increased to 15 s and went as high as 30 s. The individual and mean response times for each search engine and for each query during off-peak and peak hours are shown in Tables 1A and 1B, respectively. The precision score for each query on each search engine is tabulated in Table 2. The mean precision scores for each search engine ranged from 0.4 to 0.7. Although the ranking of the precision scores varied amongst the search engines depending on the query, Google obtained the highest mean precision score of 0.7 while Yahoo obtained the second highest precision score of 0.6. Gigablast obtained the lowest precision score of 0.4. The highest precision score for query 10 (i.e. a long query) was 0.4 (Google and Yahoo), which indicates that the search engines had more difficulty in processing long queries compared to the shorter queries. This result implies that users wanting the most relevant search results should be as precise as possible in their search queries, supplying only the most important terms. 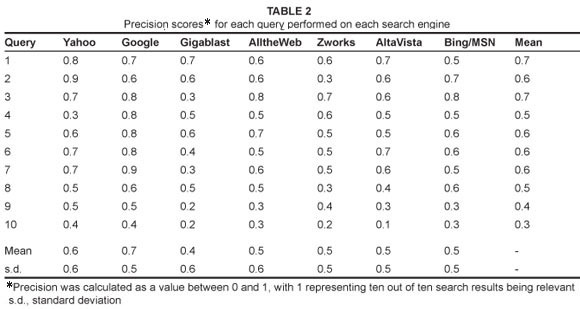 Table 3 shows the seven search engines ranked in terms of their response times (from shortest to longest) and precision scores (from highest to lowest), with a rank of 1 denoting the best performer. The average of both rankings gives an indication of the overall performance of each search engine. For both response time and precision, Google proved to be the best performer of all the search engines evaluated. Hence it is the search engine we recommend. MSN/Bing, the second best performer, is also recommended. Gigablast and AlltheWeb were the worst overall performers in this study.